The basketball/martial arts master Shaquille O'Neal trademarks Shaqfighter. Shaq isn't just a retired basketball star, he's a one-man media empire. While Mine O'Mine might be the company behind ventures like Shaq.com, I'd like to think that Mr. O'Neal pops in to offer wisdom on things like proper data sorting algorithms and marketing demographics from time to time. Now, it looks like Mine O'Mine has more going on than just ghostwriting his blog because it's just registered a trademark for "Shaqfighter". According to the filing, Shaqfighter applies to "video games, computer software, online games, and action skills games", which means that it's likely a fighter involving Shaq. This isn't Shaq's first foray into the wide world of interactive electronic entertainment. His first was Shaq Fu, the notoriously broken fighter from the 16-bit era. More recently, his likeness has graced ShaqDown, an endless runner on iOS. In Shaq Fu, he falls into a dimension full of martial arts while on his way to a charity event. 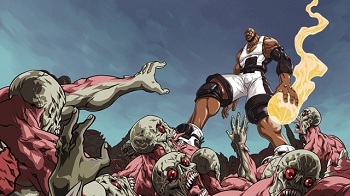 In ShaqDown, he battles hordes of mutants and zombies. Both games feature a distinct lack of basketball. Because this is just a trademark filing and not a game announcement, there are no details yet. Perhaps Shaq's been intimidated by games like Barkley Shut up and Jam: Gaiden and wants to assert his dominance in the competative fighting arena. Whatever the outcome, I'm hoping that Shaqfighter includes Kazaam and Steel as unlockable characters.